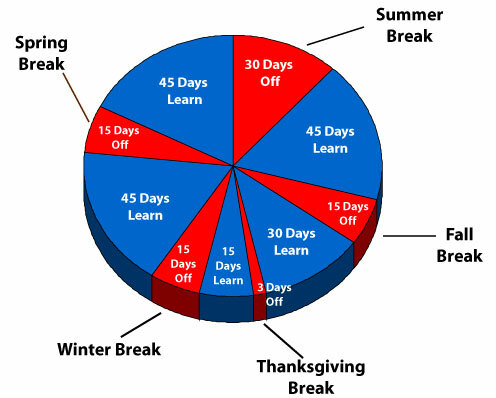 The pie charts below compare the distribution of instructional days and days out of session on the nine-month traditional calendar vs. the distribution of school days on a balanced or modified calendar. Weekends are excluded from the charts, with both models represening a standard school year of 180 days. instructional days, with the first break coming at Thanksgiving. 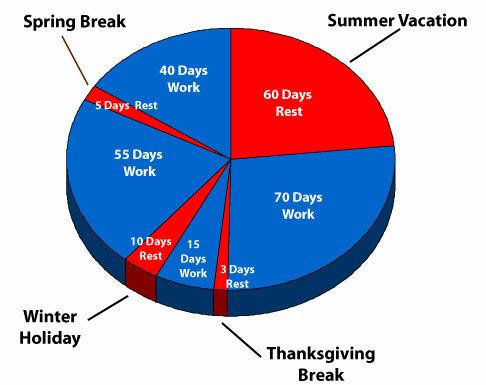 The winter holidays are followed by 55 instructional days before a short spring break. Spring break is followed by 40 instructional days before the end of the school year. The balanced calendar reduces the long summer break and simply apportions those days throughout the school year, producing more frequent breaks and thus limiting long periods of in-session days, as well as longer vacations. Both calendars feature 180 days of instruction, with the modified calendar balancing the frequency of in-session days with days on break. The winter break and Thanksgiving break can be the same on both calendars. Multi-Track is used primarily to alleviate overcrowding, although it also incorporates the educational values of single-track YRE, including intersessions. It was designed specifically for schools with a shortage of classroom space. Multi-track is used to avoid double sessions, building new schools and temporary structures. It not only saves on capital construction costs, but also on ongoing operational costs associated with adding a new school. Multi-track divides students and teachers into groups, or tracks of approximately the same size. Each track is assigned its own schedule. Teachers and students assigned to a particular track follow the same schedule and are in school and on vacation at the same time. Multi-track creates a "school-within-a-school" concept. Example: implementing a four-track year-round calendar extends the capacity of a school by 33%. A school with the capacity of 750 students can accommodate 1,000 students, as only three tracks of 250 would be in school at the same time; there would always be one track on vacation or intersession every day of the school year. A five track model (60-15) allows for a 25% gain in capacity.